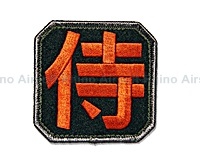 A straight forward patch that says SAMURAI in Japanese Kanji. Don't worry I did my research and had it approved by Japanese native speakers. The word Samurai is derived from the archaic Japanese verb samorau, changed to saburau, meaning "to serve". Thus this meaning applies well to Military / LE / GOV whom serve their country.